It said that President Wade, aged 81, won more than 50% of the votes cast, making a run-off unnecessary. Mr Wade had received 55.86% of the votes, beating 14 other candidates, electoral commission head Cheikh Tidiane Diakhate said at a news conference in the capital, Dakar. He said that former Prime Minister Idrissa Seck had polled 14.93%, followed by opposition Socialist Party Ousmane Tanor Dieng, who had gathered 13.57%. The commission's tally confirmed provisional results issued earlier this week. If the results are confirmed by the Constitutional Council, Mr Wade will serve five years in office. Observers from regional body the Economic Community of West African States have said the voting on Sunday was free and fair. 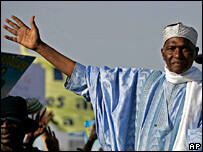 Senegal, a predominately Muslim nation, is seen as a rare model of stable democracy in Africa. It is the only West African nation not to have experienced a coup since independence, and polls in 2000 passed off peacefully. Some five million people were eligible to vote, which is almost double the figure in the last election. During Mr Wade's first term, parliament voted to reduce the presidential term from seven to five years. Is Senegal's 'model democracy' tarnished?